There are so many south Indian breakfast options, that one can go for weeks without repeating. 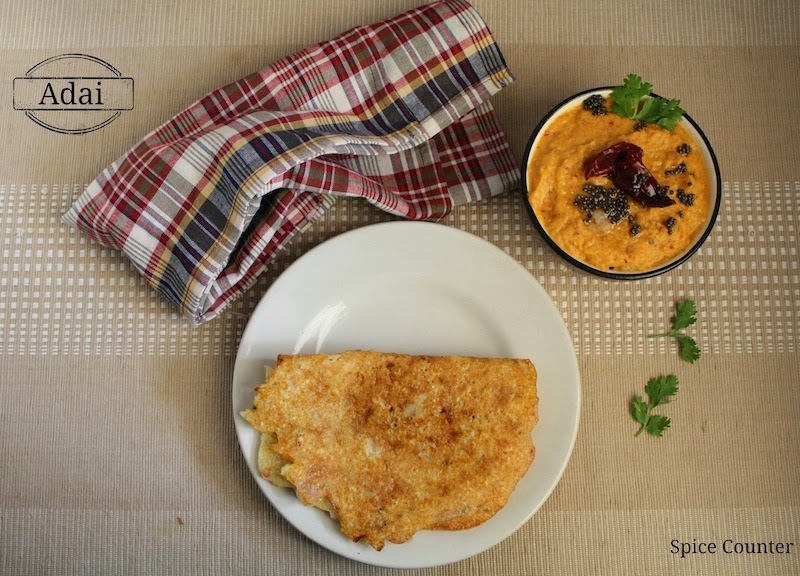 Adai (or Ada) is one of the many types of dosas that can be had for breakfast or dinner. If you are a south Indian, you will definitely have your own version of this recipe. Adai is a protein rich meal. I have used assorted lentils and rice in equal proportions. For the Batter, wash and clean the rice and lentils separately. Soak the rice for 6-8 hours and the lentils & red chillies for 3-4 hours. Grind the rice finely in a mixer with very little water (about ¼ cup or lesser). Once its ground finely, add the lentils, red chillies & salt and pulse it a few times till the lentils are coarsely ground. Transfer to a container and add water to give it a cake batter like consistency. Heat oil in a small pan. Add the mustard seeds, once it pops add the asafetida & curry leaves and pour this on to the dosa batter and mix well. Now add the chopped onions to the dosa batter. To make the Dosas, heat a flat pan. Spread oil across the pan. Pour a ladle full of batter on the hot pan and spread it in a circular motion. Pour ½ tsp oil on the sides of the dosa. Cook till its brown in colour. Flip it over and cook the other side. Transfer to a plate and serve hot with chutney! The number of red chillies can be increased/decreased to suit individual palette.